Can Online Video Games Help Us Be More Empathic? I recently wrote a post pondering the question, "Are Online Video Games Kinda Making Us Socipaths?" Now I'd like to look into the opposite, more positive effects of online video games. Many people commented how online games may be giving some a license to act badly. We know that video games run the gamut of rewarding violence and destruction but they also go to the opposite side of the spectrum by rewarding kindness and other pro-social behaviors. 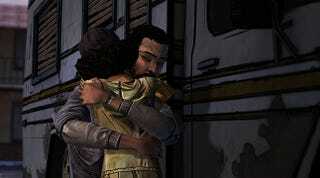 For example, Telltales' Walking Dead video game places us in a position to make choices that either distance ourselves or bring us closer with the other characters in the game. There are positives of taking either path for ourselves in real life, lessons we can take away by role playing how we can act. These interactions with game character do have their merits, however I want to focus on interactions with other gamers. Are Online Video Games Kinda Making Us Sociopaths? To get to the root of the question I am posing, let's first read the definition of empathic. *In my previous article, many commenters seemed to ignore the definition of sociopath from Merriam Webster, in favor of their own definition of the word. As an example here is part of a comment from that article. "don't confuse rage with a lack of consideration for other human beings for being a sociopath. they're not the same thing." If the commenter had read the definition provided, he would know this fits the precise definition of sociopath which is, a person whose behavior is antisocial and who lacks a sense of moral responsibility or social conscience. Someone who behaves in a dangerous or violent way towards other people and does not feel guilty about such behavior. So without further ado, I give you the definition of empathic. The adjective empathic describes the ability to understand other people's feelings. Empathic people are sensitive to the way others feel, and even seem to share those feelings. As the previous article focused on the negatives of the online gaming communities, I want to now delve into the positives. Many people have made lifelong bonds and friendships through playing online games and it is unfair to highlight only the negativity that some of experience in these communities. Again, while many game developers have been including prosocial themes in their games, the focus of what we are talking about is how online gaming communities are affecting us. Blizzard's battle.net online gaming platform has been my community of choice for a long time. I've made a lot of really good friends through their service, I know many of them in real life, I have also developed great relationships with people I've only been in contact with through gaming. Some of my gaming friends have become buddies I talk about as if I know them in real life. I know about their real life, if they are married, how many kids they have, what their names are, etc. Playing co-op games while using a voice chat program really helps me get to know them. Some of us have even been able to meet and have ourselves an in-person LAN party. That's not to say we will all be able to meet our online friends, but it can be a springboard for a profound real life friendship. Sometimes our friendships become deeper through video games as well. Back in the heyday of Nintendo 64, having the ability to include 4 people in a game was an amazing concept. I took full advantage of Mario Kart, Goldeneye, Starcraft 64, etc. However, it's also been true that I have met people in real life, who just so happen to play the same games and we forge a stronger bond while fighting demons and building armies in space. While we do tend to talk a lot about the game we are playing at the time, these interactions lend us time to talk about much more. My friend Andy is a great example in my life. I was friends with his girlfriend in real life before I ever met him, but we became close through playing Diablo 3. We have remained friends, even though he moved across the country. He has also invited me to game parties with his other online buddies, who I've subsequently befriended. Now we have our games to fall back into and chat while grinding the dungeons of Sanctuary. I plan to visit Andy and his girlfriend in their new place in California and I can thank video games for how we have become closer friends. Many of the internet denizens have also forged great relationships with people they may never meet in real life as well. That is why I am inclined to say yes, online video games do have the ability to help us become more empathic. We are able to not only connect and understand the feelings of characters in our games, but also with our fellow online gamers. It can be a real shame when we are not afforded the possibility of getting to know someone because they show their toxic side, but I'd like to think behind anything negative there is a potential friend. Perhaps one day the competitive sportsmanship spirit will break down barriers that can exist and there will be more opportunity to build relationships. As it stands, there are already great possibilities to make those friends.